The Mid March 2015 Issue of Practical Welding Letter, Bulletin 106, dealing with online Resources on Welding Automation (NEW), was not distributed by e-mail but it is available at Bulletin 106 and from the updated Welding Resources Page. Believe it or not, we are now at our 140th issue of Practical Welding Letter. I am proud of this achievement, hoping that some of my readers find from time to time a few bits of useful information. We open with a note on welding Superferritic Stainless Steels. It is reported from the most learned and instructive column of Damian J. Kotecki, a world renowned expert, published in the Welding Journal, that I heartily recommend to all readers wishing to improve their knowledge on stainless steel welding. Those who use vacuum furnaces may have a problem they are not aware of. That is what happened to workers of a major furnace manufacturer who found unacceptable results in certain batches of vacuum carburized parts. Their investigation explained the mishap, that should be avoided by all involved. Silver alloy brazing is very popular and provides very good results. It is also quite expensive, being based on a precious metal. That explains the search for substitutes, that may or not be acceptable for specific applications. Drastic revolutions in the basic knowledge of alloy making happens only once in a while. A completely new way of making large numbers of metallic alloys that did not exist before has been established in a little more than a decade. The amazing discovery is that many of these new alloys show exceptional properties, that will be used in future demanding applications. Traditional metallurgists may find out that they were left behind, until they catch up by learning the mysteries of high entropy alloys. 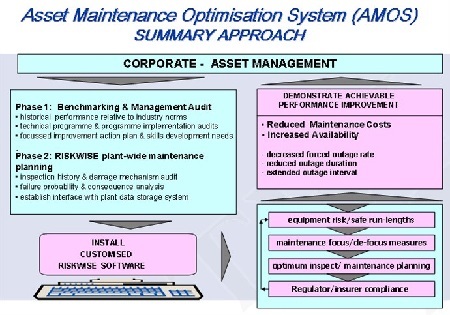 With the aging of large and important industrial installations in many different fields, a new approach was slowly developed, reaching in time the enviable status of a well organized discipline, named Asset Integrity Management. This discipline, when applied correctly, permits to limit the operational risks by checking in a continuous way the integrity of all subassemblies, and helps to extend the useful life of critical components in a safe way, well beyond the original design life. In the new Pages of the Month two items are added. Welding-Automation is introduced and a Page on such Resources is offered that may help readers in their search for finding what innovations are offered by commercial enterprises. The other columns are at their usual place. Questions, Feedback and Comments are welcome. Please use the Contact Us Form. We would appreciate learning which articles were enjoyed most. For your queries you may use the Search box appearing in almost all pages of the website. The Site Map is also a good starting point for a query. 2 - Article - Precautions when welding Superferritic. An introduction to welding Superferritic Stainless Steels was published (2) in Issue 115 of Practical Welding Letter for March 2013. Click on PWL#115 to see it. Here we report on a note by Damian J. Kotecki in his Q&A section published in the March 2015 issue of the Welding Journal at page 20. Asked for pitfalls of welding such steels, the world renowned expert of anything stainless, cautions against contamination of shielding gas (argon or helium) with nitrogen or hydrogen entrained from surrounding air if turbulent (instead of laminar) flow occurs over the weld area. Hydrogen must be avoided also in the form of moisture from surrounding air. Also excessive heat input or exposure to high temperature may promote the precipitation of dangerous phases or intermetallic compounds that can embrittle the weld or the heat affected zone. Repair welding is risky and must be avoided or at least qualified by examining the resulting ductility that may be impaired. The recommended solution is adopting mechanized or fully automatic Gas Tungsten Arc Welding. Some grain growth in the weld and in heat affected zones (HAZ) is unavoidable, but a little can be tolerated. Grain growth is a cause for the loss of toughness (shift to higher ductile-to-brittle fracture transition temperature) in the HAZ. 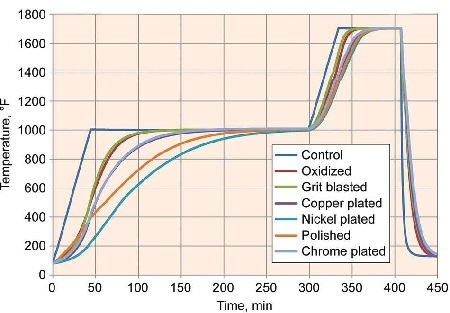 Undoing grain growth once it occurred is practically impossible in normal production situations involving welded heat exchangers of these superferritic stainless steels. The author concludes: "So it is essential to weld correctly the first time to avoid any need for repair". The accepted practice used to measure temperature in vacuum furnaces is to place suitable thermocouples into small holes drilled into dummy blocks. It seems simple and correct, and easy to perform. Except that researchers of a major furnace manufacturer found an unexpected surprise when trying to develop a vacuum carburizing cycle for a workload of a certain part. The depth of the carburized case resulted shallower than required. This indicated that the parts were not held at the correct temperature long enough before carburizing. The investigators reached the conclusion that surface emissivity is an important factor to consider. Therefore they set up an experiment to test the heating rates in various blocks with different surface conditions and finish. The testing program performed is summarized in an article published in the HTPro supplement of the ASM Heat Treating Society, included in the March 2015 issue of Advanced Materials and Processes (AM&P), a publication of ASM International, at page 40. A workload with a particular surface condition compared with a workload of the same material with another surface condition could take up to twice as long to reach the desired temperature. Interested readers are urged to seek the original publication. on time to heat carbon-steel test blocks in a vacuum furnace. Once again our preferred source for innovations in Brazing is the insert Brazing and Soldering Today, published periodically in the Welding Journal. In the March 2015 issue at page 40 one can find the article on the evaluation of the new materials highlighted in the title to this note. The drive to look for alternatives to the excellent silver based brazing filler alloys is the high cost of silver. Those proposed till recently were unable to match the properties of the original alloys they were intended to substitute. A commercial company took the initiative to formulate and test new brazing alloys intended to be less costly due to the absence of silver. But the article recognizes that "there are still no silver-free brazing filler metals in the industry that provide low brazing temperatures and have sufficient ductility and strength of brazed joints". The difficulties with new alloys include the relative propensity to develop brittle intermetallic compounds and precipitates like carbides nitrides or phosphides. The article describes the brazing performed in air by heating with a propane torch low carbon steel both bare and nickel plated and 304 stainless steel, using the two proposed new silver free alloys. For comparison also two silver containing and another known silver free alloy were employed. Testing conducted on the samples included metallographic examination and spreading area evaluation. Shear strength and ductility were determined by tensile testing of brazed specimens. The conclusion of the study permits to assert that one of the proposed new commercial alloys provides sufficient strength and ductility to show performance comparable to the best silver based alloy. Unfortunately its melting range is much higher than that of the material it should have substituted. Interested readers are urged to seek the original article indicated above. Inspection Activities include formal review, verification and assessment of specific documentation, means and practices to be used before, during and after welding completion. Linear Elastic Fracture Mechanics (LEFM) first assumes that the material is isotropic and linear elastic. Based on the assumption, the stress field near the crack tip is calculated using the theory of elasticity. When the stresses near the crack tip exceed the material fracture toughness, the crack will grow. LEFM is a highly simplified, yet sophisticated, theory that deals with sharp cracks in elastic bodies. Mechanical Structure Sensitive Properties include Ultimate Strength, Yield Strength, Fatigue Strength, Hardness, Ductility, Elastic Limit, Damping capacity, Creep Strength, Rupture Strength and Toughness. Notched Specimens are used in various types of impact testing for evaluating materials under different testing temperatures. Oxygen Cylinder is the container used to store and transport pure compressed oxygen for industrial use. Projection Weld Size is the diameter of the weld metal in the plane of the faying surfaces. Resistance Welding denotes a group of welding processes that produce coalescence of the faying surfaces with the heat obtained from resistance of the workpieces to the flow of the welding current in a circuit that includes the workpieces, while mechanical pressure is applied. Single Bevel Groove is a joint formed between the beveled edge of one element and a planar surface of the other butting member. More than a decade already passed from the first trials concerning a new class of complex metallic materials potentially capable of exceptional mechanical properties. Several research centers around the world are busy with exploring different aspects of this new field, developing these materials and testing their properties. They are different from conventional alloys in that they are built of five or more principal elements, all of them in large proportions of about the same molar concentration (equimolar ratio). This is a major change in alloy design from traditional physical metallurgy, and it opens up a new path for explorations of new materials and new properties. These are called High-entropy alloys (HEAs), standing at the new research frontier. The name comes from the fact that they appear as random solid solutions of many elements, much more stable than traditional alloys because of their large entropies of mixing, which are responsible for their lowered tendency to ordering and segregation. During solidification these alloys tend to form nanostructures of ultrafine crystallites, that greatly improve their strength and hardness. Some of the alloys behave as if their phases were undergoing a solution hardening mechanism. Other alloys show remarkable resistance to anneal softening. Some of these alloys, with good stability, high temperature strength and acceptable ductility are promising candidates for high temperature applications in that they provide also corrosion and oxidation resistance. 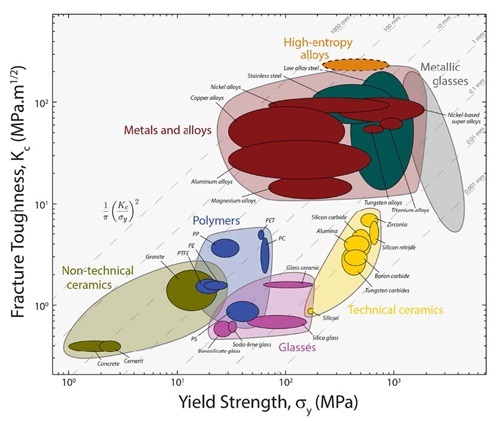 But their most striking feature is possibly the potential for the development of countless new alloys, just by exploring the combinations of mutually miscible metallic principal elements, ready for further modification of processing and properties. The sheer number of those possible combinations is the main reason for the long development time that must be dedicated to experimental research before announcing any set of researched alloys ready for tentative applications. Traditional metallurgists may feel overwhelmed by this new information. It will take time until they absorb the fundamental knowledge in the field, summarized in the following book. A thorough presentation can be found in the Description, available from the reported link hereafter. The Pages of this Month deal with a hot subject: how can a shop upgrade productivity without taking excessive risks. Whenever a production line is fed continuously by a substantial order backlog, even if the batches are somewhat different, it is probably the right time to explore in detail what could be done to enhance production, how much the project would cost and what benefits could be gained. The new website page is available by clicking on the link Welding-Automation. The page of Resources on Welding Automation is available from the link Bulletin 106. Some useful information might be obtained from both pages for all curious people wishing to know more on the subject. As usual readers already know, large amounts of knowledge are freely available to anyone in the Welding Advisers website. One can review the Site Map and the Index Welding Page to find what one looks for. One can also perform a search, by typing the requested terms in the box that appears in almost every page of the Welding Advisers website: the Results Page(s) will include also the pertinent articles of all issues of this Practical Welding Letter. ...how to steal oxygen from air? ...how to restore dinosaur fossils? ...what Oxygen makes to Titanium? ...how to use silicon nanofibers? 9.1 - Galvanic Series is a list of metals and alloys arranged according to their relative corrosion potentials in a given environment. 9.2 - Hot Pressure Welding is a solid-state welding process that produces coalescence of materials with heat and application of pressure sufficient to produce macrodeformation of the base material. 9.3 - Impact Test is used for determining the energy absorbed in fracturing a test piece at high velocity, as distinct from static test. The test may be carried out in tension, bending, or torsion, and the test bar may be notched or unnotched. 9.4 - Ledeburite is the eutectic of the iron-carbon system, the constituents of which are austenite and cementite. The austenite decomposes into ferrite and cementite on cooling below Ar1, the temperature at which transformation of austenite to ferrite or ferrite plus cementite is completed during cooling. 9.5 - Milling Cutter is a rotary cutting tool provided with one or more cutting elements, called teeth, that intermittently engage the workpiece and remove material by relative movement of the workpiece and cutter. 9.6 - Nucleation is the initiation during recrystallization, of a phase transformation or of the growth of a new phase, and possessing an interface with the parent metallic matrix of a phase at discrete sites, with the new phase growing on the nuclei. Within an industrial organization involving the operation of complex plants, Assets Integrity Management is the function charged with demonstrating that, as far as it is reasonably practicable, the integrity of the assets is properly taken care of. Typical of the kind of environments bound to enact an effective policy, capable of achieving operational excellence and maximum asset performance with acceptable results at minimum cost, are oil and gas production, transportation and refining facilities, power generation plants, and chemical factories using dangerous materials. A well managed program helps operators identify deficiencies, care for health, safety and the environment and reduce safety risks before they escalate. Furthermore, by focusing on asset integrity, it can also play a major role in extending the life of aging assets. The purposes are obviously to avoid major disasters, likely to injury human lives and to compromise the returns on important financial investments, but it has slowly been accepted that this policy is also essential to the success of the business. It is important that the single individuals charged with the responsibility to promote actions and to take decisions affecting asset integrity be fully aware of their responsibility and be totally committed to their task. But the success of a company’s ability to operate safely and efficiently depends heavily on the cooperative spirit and on the mutual confidence that the management is able to instill in the organization and in all its members. Many commercial enterprises offer specialized investigations and other consulting services on the current fitness to service of individual components or of complete installations during the whole lifecycle of the asset. [...] Expecting your early reply. It should not come as a surprise to my readers that, implementing my new policy, I am now asking the payment of a modest price, USD 10.75, for any answer they may wish to get from me. It was not an easy decision from my part, but it came to me most naturally as I realized, after years of answering to the most strange and not-sufficiently-thought-through questions I got. For one thing, I can see a useless query from a distance, when essential details are missing in the formulation of the question, often vague and ill defined. It appears as if the inquirer signals me he/she is not really interested in the problem and any reaction would be accepted. What disturbed me most was the fact that most of the recipients, even as I dedicated quite some time to research and write down my answer, accepted it as due from me, without even thinking of thanking me for my effort. I would have expected, quite naively I admit, that they should be grateful for some real help, and care to provide some follow up on how their problem was finally resolved. That would have been the most sought after prize for my labor. It should not be understood that I am ready to study and provide useful answers for any project that might be thrown my way, for the meager price mentioned above. Far from that. A good project will cost quite a sum, proportional to the effort and time required, and to the benefits to be gained. I can see sometimes big problems that the inquirers have no idea how they should be tackled for saving substantial waste of efforts and resources. But they refrain from the idea of asking professional help, for some ill conceived conviction that they know better. I would be delighted to be asked to provide substantial benefits for solving some of the most nagging hindrances occurring in real production. But someone should be first convinced that it may pay to look after solutions. May 12, 2015 - May 13, 2015 - Minneapolis, Minn.